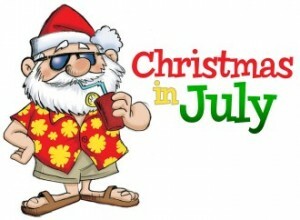 Christmas in July Coming Soon! Check back on Thursday for our Christmas in July special – we have a surprise for you! Kick-off summer and stock up on CEUs with 25% Off ALL Courses this Memorial Day weekend! Enter promotion code MemDay25 at checkout and click “update” to apply. If your order total is $100 or more (after discount), we’ll issue you a $25 credit that you can use on your next order (code will be sent via email within 1 business day). May Bonus Bucks expire 5/31/2013. Memorial Day Sale ends at midnight on Monday, May 27, 2013. Coupon valid on future orders only and must be applied at checkout (click ‘update’ to apply – you will see discount deducted from total before entering payment information). Professional Development Resources is approved to offer continuing education by the American Psychological Association (APA); by the National Board of Certified Counselors (NBCC Provider #5590); by the Association of Social Work Boards (ASWB Provider #1046, ACE Program); by the National Association of Alcoholism & Drug Abuse Counselors (NAADAC Provider #000279); by the American Occupational Therapy Association (AOTA Provider #3159); by the American Speech-Language-Hearing Association (ASHA Provider #AAUM); by the Commission on Dietetic Registration (CDR Provider #PR001); by the California Board of Behavioral Sciences (#PCE1625); by the Florida Boards of Social Work, Mental Health Counseling and Marriage and Family Therapy (#BAP346), Psychology & School Psychology (#50-1635), Dietetics & Nutrition (#50-1635), and Occupational Therapy Practice (#34); by the Illinois DPR for Social Work (#159-00531); by the Ohio Counselor, Social Worker & MFT Board (#RCST100501); by the South Carolina Board of Professional Counselors & MFTs (#193); and by the Texas Board of Examiners of Marriage & Family Therapists (#114) and State Board of Social Worker Examiners (#5678). May Bonus Bucks Are Here! 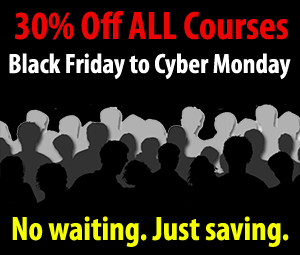 30% Off ALL CE Courses Ends Today! Today is the last day to shop online and save 30% on ALL continuing education courses! Enter coupon code BFCM2012 during checkout @ www.pdresources.org to apply. Hurry, sale ends at midnight tonight! Click here to shop CE! Coupon valid on future orders only. Click ‘update’ on shopping cart to redeem discount. To kick off the holiday season, Professional Development Resources is offering 30% off ALL continuing education courses – this weekend only! No lines. No waiting. No traffic jams. Just huge savings for your online CE needs. Hurry, sale ends at midnight EST on Cyber Monday, November 26, 2012! 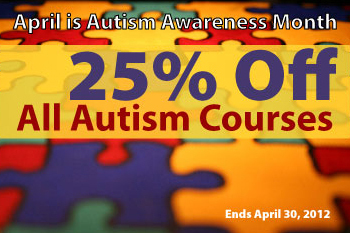 Professional Development Resources, a proud member of the Autism Society, is offering 25% off all Autism continuing education courses during the month of April to promote education and awareness. New research showing one in 88 U.S. children have autism spectrum disorders is focusing national attention on the need for earlier diagnosis and treatment, especially in rural and minority communities. Figures released Thursday by the Centers for Disease Control and Prevention show a 23% increase in autism spectrum cases from 2006 to 2008, and 78% increase since 2002. 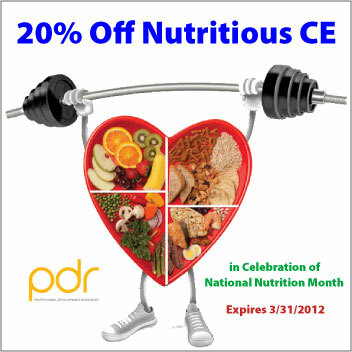 29% Off CE thru Leap Day & a FREE Course for Leaplings! February 29th is special…it’s the reason that a season comes at the same time every year. 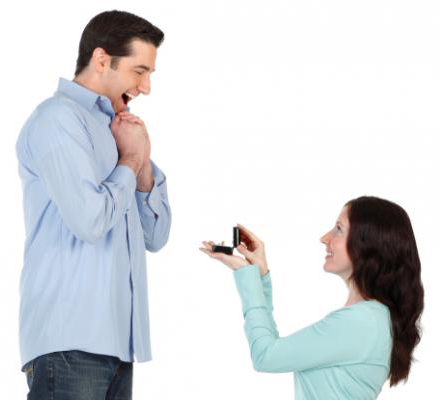 According to folklore, leap year day gives those women who don’t want to wait for a marriage proposal the go ahead to pop the question themselves. It takes the earth one day to complete one spin on its axis. The time it takes the earth to complete one trip around the sun is a year. But these units of time don’t divide evenly, resulting in our calendar year being 365 days, 5 hours, 48 minutes and a little over 45 seconds long. Every 4 years we take those extra hours and minutes and fit it in an extra day, on February 29th, which we call Leap Day. Every fourth year thus is Leap Year. If we did not have the extra day every 4 years, in 100 years our calendar would be off by 24 days. You can still save on CE through Leap Day – how about 29% off ALL courses? Just use coupon code LEAPDAY12 at checkout to apply savings. Coupon valid on future orders only (cannot be applied retroactively). Coupon expires 2/29/2012. $10 Instant Rebate on orders over $50! Don’t forget to enter the coupon code (Season11) during checkout. Due to the automated nature of our ordering system, we are unable to apply discounts retroactively. Coupon valid on future orders only. Instant rebates are automatically applied at checkout (order total calculated AFTER coupon discounts). Learn how to spend more and save more. Black Friday Savings Start Today! 25% Off ALL Continuing Education Courses – 6 Days Only! To kick off the holiday season, Professional Development Resources is offering 25% Off ALL continuing education courses! Enter coupon code BFCM2011 during checkout @ www.pdresources.org to redeem. 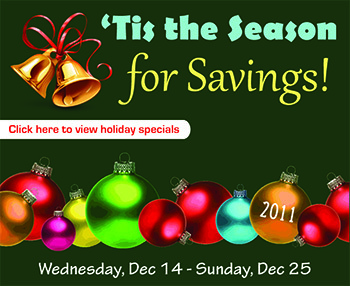 Hurry, sale ends at midnight EST on Monday, November 28, 2011.